The feeling of scoring a goal is unmatched by most common things in a footballer’s life, from a tap-in for your Sunday league team or the winner for your country in the World Cup final. Some players express joy more than others; some don’t express any feelings at all. While the euphoric scenes in the stands after the ball hits the back of the net haven’t changed much since the 1950s, goal celebrations have become more individual and carry a higher significance as part of the footballing spectacle. There have been important figures over recent decades who’ve charted this change, from Tardelli to Totti, and there will be more trailblazers in the years to come. Rewind to 60 years ago and things were very different. A jump in the air and a handshake were enough before heading back to the halfway line for the restart. With the lack of television coverage in the decades before and just after the Second World War, the sport was a show to those inside the stadiums and few others. Players’ reputations were formed by what they did with their feet, not a signature dance or a worldwide craze. It wasn’t until the 1980s that a player’s joy and passion came out in the form of a goal celebration. The 1982 World Cup in Spain set the benchmark as several players during the tournament expressed their satisfaction of scoring a goal by sprinting away to embrace teammates or falling to their knee – but one man in particular is remembered for setting the touch paper alight. His countryman, Fabio Grosso, would recreate this celebration after his winning goal against Germany in the 2006 World Cup. After a difficult start to their World Cup campaign, Italy surged through the second group stage to earn a spot in the semi-finals. Paolo Rossi’s double at the Camp Nou against Poland was enough to send the Azzurri through to their first World Cup final since 1970. The following night, the West Germans progressed past France in a thrilling tie following a penalty shoot-out. It was at the Santiago Bernabéu where, after Rossi had given the Italians the lead, Marco Tardelli struck from the edge of the area to spark wild scenes on and off the pitch. After Tardelli’s off-balance shot had stunned Harald Schumacher in the West German goal, he raced off, screaming and clenching his fists in front of him. A camera at the opposite end of the ground caught the outpouring of emotion in all its glory before Tardelli and the rest of his compatriots embraced beside the Italian dugout. The midfielder’s celebration is often remembered more than his actual contribution to the final result because, at that time, few players reacted with such raw emotion on the world stage after finding the net. Fast-forward to the 1990 World Cup and Roger Milla was the man of the moment, even at 38-years-old, as his Cameroon side made it to the quarter-finals. After each of his four goals during the tournament, including a brace against Colombia in the last 16, Milla went over to the corner flag and performed an exuberant dance with one arm in the air while wiggling his hips. The stage of a World Cup was crucial as his routine earned global acclaim and proved that it’s never too late to become a superstar. The corner flag has often been used as a stage for celebration since. Former Everton and Australia legend, Tim Cahill, enjoyed many a boxing match against it, pulling out his signature move in three different World Cups. Didier Drogba used the corner flag as a makeshift guitar while Florent Malouda played some invisible drums as Chelsea fired their way to the Premier League title in 2010 with an 8-0 win over Wigan. South America’s footballing flair also translated into their celebrations. During the 1994 World Cup in the USA, Carlos Alberto Parreira’s Brazil side won their country’s fourth title. In their 3-2 win over the Netherlands in the quarter-final, Bebeto wrote himself into history by running onto a long ball, rounding Ed de Goey and slotting into an empty net. To celebrate the recent birth of his son, he ran away in celebration, cradling an imaginary baby in his arms. Before he could finish, he was joined by Romário and Mazinho, who mimicked his actions. The image of the three players with their arms cupped in front of them, swinging side to side, is one of football’s most enduring images. Another South American made headlines for his celebrations during that World Cup, but this time it was for all the wrong reasons. 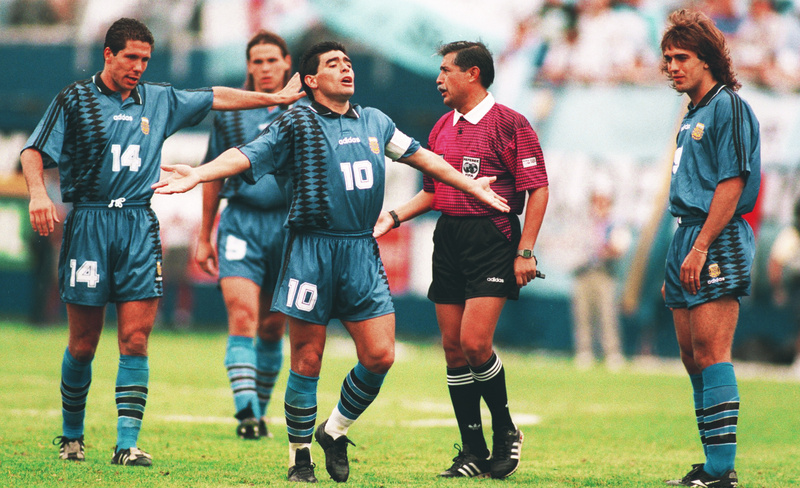 Over his international career, Diego Maradona had written himself into folklore with sensational solo goals and controversies aplenty, but he left the global stage in disgrace in the USA that summer. Maradona’s use of recreational drugs had been no secret during the latter stages of his career but his celebration against Greece during a group stage game in Foxborough revealed something much more sinister. After powering a shot into the top corner from the edge of the box, Maradona ran over to the camera, eyes bulging and teeth bared. A few days later, reports emerged that Maradona had tested positive for ephedrine, a performance-enhancing drug, after the game. When the legendary Argentine crossed that white line at full-time against Greece, he wouldn’t return to play for his country again. The final decade of the 20th century saw the first trademark celebrations come to the fore. A young striker was making his way in English football at Southampton and Blackburn, winning the Premier League title with the latter. A potent goalscorer, Alan Shearer is also well known for his signature celebration of raising one arm in the air, which he did after most of his record 260 Premier League goals. No image is more associated with the Gallowgate End at St James’ Park than the local boy celebrating finding the net. Simplicity was often best. Eric Cantona’s sublime chip against Sunderland in 1996 saw him milk the adoration of the Old Trafford crowd, gazing around the Theatre of Dreams before lifting his arms in the air. For most players this would’ve been considered arrogant, but for Cantona, it was part of the player he was. In the same way that Cantona’s celebration reflected his personality, Paul Gascoigne hit back at the English papers during Euro 96 in comedic fashion. His stunning lift over Colin Hendry and volleyed finish past Andy Goram during the group stages doubled the host nation’s lead over Scotland but, despite the brilliance of the goal, the celebration that followed is just as famous. After pictures emerged of England’s players out of control in a Hong Kong bar during a pre-tournament training camp, Gascoigne decided to recreate the scene by having water squirted at him whilst he lay down beside the goal with his mouth open. Before the tournament, the media had questioned the responsibility the England players like Gascoigne – so they hit back in the best possible way. Gascoigne wasn’t the only one to answer his critics in the media in England during the 1990s. 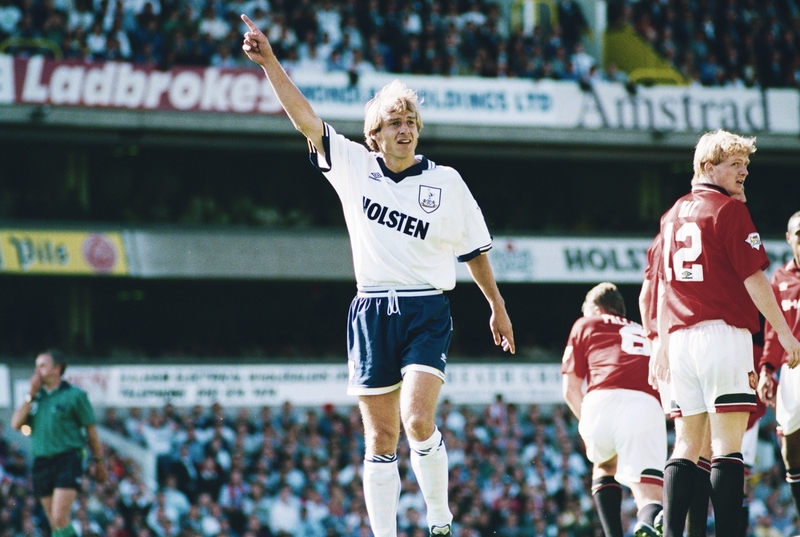 Tottenham’s Jürgen Klinsmann performed an exaggerated dive after scoring against Sheffield Wednesday having been ridiculed for diving for Germany during the 1994 World Cup. Another example of players jokingly proving a point during their celebrations came at the Etihad Stadium over a decade later. In December 2008, Hull City were trailing 4-0 at half-time against a rampant Manchester City side and, after the poor first-half showing, manager Phil Brown decided to conduct his half-time team talk on the pitch. 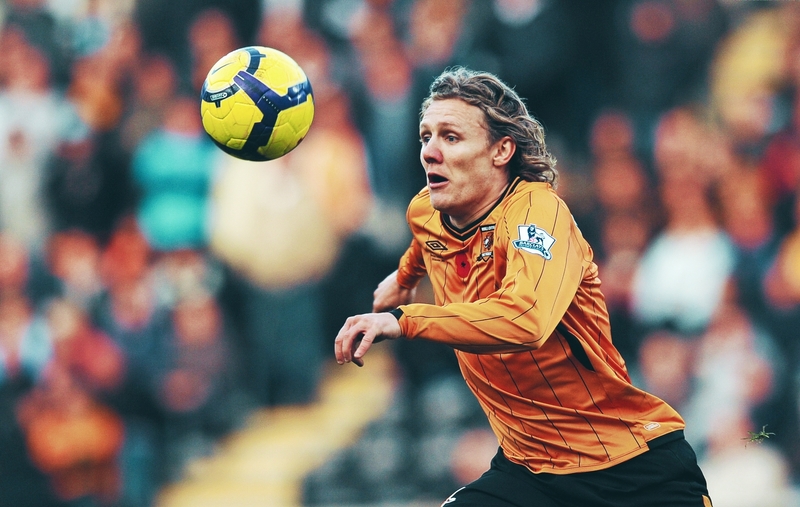 A year later, after Jimmy Bullard had converted a penalty in the same fixture at the same end to equalise, the players recreated the scene with Bullard, who hadn’t been at the club the year before, acting as Brown, pointing angrily at the group of seated players. Hull went on to draw the game and Brown later described the celebration as “brilliant”. Bullard is renowned for his humour and is one of the most distinct characters in Premier League history. Another is Arsenal’s former striker Nicklas Bendtner, who was banned and fined for revealing sponsored underwear after scoring for Denmark against Poland at Euro 2012. Denmark have history when it comes to notorious celebrations in major tournaments. During their World Cup quarter-final meeting with Brazil in 1998, Brian Laudrup brought the score level at 2-2 just after half-time by firing a shot past Cláudio Taffarel at his near post. Laudrup then proceeded to slide on the floor, ending up on his side while resting his head on his hand in possibly the most relaxed goal celebration in football history. Certain countries are linked to one particular celebration and, when the whole team gets involved, it’s more than memorable, from Senegal’s dancing in 2002, South Africa’s routine in 2010, Colombia’s samba moves in 2014 to Tahiti in the Confederations Cup in 2013. The island nation were the smallest team to qualify for a FIFA tournament when they reached the Confederations Cup in Brazil and, after their only goal of the tournament during a 6-1 defeat to Nigeria, the team formed an imaginary rowing boat, wading in water with an oar. In contrast to a nation’s joy of scoring during a major tournament, the act of not celebrating a goal has become far more common in the last two decades. Whether you agree with it or not, players often show respect for their former employers if they happen to find the net against them later in their careers. An emotional Gabriel Batistuta almost broke down in tears after striking a dipping volley past his beloved Fiorentina in Roma colours. The likes of Frank Lampard, Cristiano Ronaldo, Mohamed Salah, Fernando Torres and Andrea Pirlo have all followed the same thinking. There are some, however, that break the mould. Robin van Persie opted against celebrating after scoring against Arsenal at Old Trafford for Manchester United, but the season after, he burst down the touchline, arms out, after netting against the Gunners in the same fixture. Emmanuel Adebayor raced the length of the pitch, slid on his knees and held his arms out in front of the Arsenal fans in a Manchester City shirt in 2009 but later said he regretted his actions. Maybe it’s an Arsenal thing. The Togolese striker’s successor at City was Mario Balotelli. During his time in England, the Italian always seemed to be submerged in controversy, with his antics off the pitch casting a shadow over his inconsistent performances on it. After reports emerged of him setting off fireworks in his bathroom before a crucial Manchester derby at Old Trafford, Balotelli displayed a shirt with ‘Why Always Me?’ printed on it after slotting in City’s first goal of six against Sir Alex Ferguson’s side. A few months later and he was ripping off a shirt of a darker shade of blue at Euro 2012. After giving Italy the lead in the semi-final against Germany, Balotelli powered a second past Manuel Neuer before taking his shirt off and flexing his muscles in a move that reflected the emphatic finish. Claudio Marchisio couldn’t move his chiselled figure with a hug as Balotelli kept the same stone-cold expression on his face for a few more seconds. If you take away celebrations in football, you take large parts of footballers’ identities with them, as well as some truly iconic moments. You take away Crouch’s robot, Totti’s selfie, Henry’s knee slide, Klose’s frontflip, Lua Lua’s backflips, and Ronaldinho’s cellphones. You lose Dybala’s mask, Sava’s mask, Pogba’s dab, Lacazette’s flute, Mbappé’s folded arms and Firmino’s karate kick. You lose fist-pumps, anger, bravery, tears and relief. The relief of scoring after working so hard for it. The greatest players in recent history are remembered for their signature moves as well as their God-given talent. Cristiano Ronaldo’s extravagant landing is rolled out every time he finds the net while Antoine Griezmann seems to expand on any global craze. Goal celebrations also give us different sides of players that we thought we knew. Lionel Messi is known as one of the most down-to-earth players but his decision to raise his shirt up to the Bernabéu crowd showed us the more arrogant face of football’s humble magician. Perhaps most importantly in the detached modern game, goal celebrations have the power to connect players to fans. In England, Jesse Lingard and Dele Alli’s youthful antics may be seen as childish and unprofessional, but to youngsters who follow them and play the game, it brings them closer than ever.